Today, English is unanimously the universal language being used in all fields of science and engineering. It is crucial for non-native English speaking R&D leaders in many ways: daily conversation with foreign colleagues, email exchanges with researchers abroad and writing reports on their research results. 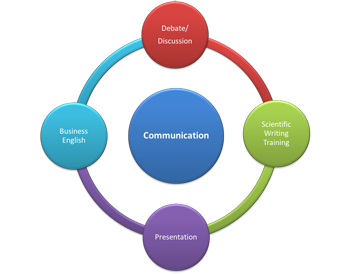 Centering on communication skills, “English Program for Young Leaders” aims to improve the graduate students’ skills in presentation, debate/discussion, scientific writing and Business English communication so that they will become the leaders who can truly express themselves in the international stage of research. “Practical English” program consists of regular English classes taught in both spring and fall semester, a two-day intensive workshop taught in summer, and a four-week study abroad program implemented in California, U.S.A. The purpose of “Practical Scientific English” (Speaking and Communication) is to develop the English communication skills of the graduate students of “Advanced Graduate Course on Molecular Systems for Devices”. Students are allocated into classes of three different levels based on their English proficiency. The individual courses are designed to give students an opportunity to improve their English language skills in a meaningful way as well as the confidence and ability to they need to make communication effectively in either an academic or non-academic setting. Every week, classes will focus on one practical language function that can be used in a variety of situations. The materials and related class activities provide the participating students ample opportunities to discuss and communicate creatively with each other in pairs or groups. The two-day summer program is designed for non-native English speaking graduate students who wish to learn how to present their research to a global audience in a better way. Sessions will cover topics including the way to design experiments, to organize and write a manuscript, and to give an effective oral presentation. Valuable suggestions on how non-native English speakers can improve their writing and oral presentation skills and how they can increase their chances of publishing their research will be provided. Active engagement between presenters and seminar attendees will highly be encouraged. The seminar presenters are former researchers with extensive experience in scientific writing and publication. Four-week study abroad program will be implemented at San Jose State University in California between February and March of their first study year with the full support of Kyushu University California Office. Students will develop their global mindset as well as English communication skills. They will also learn the reality of innovation and entrepreneurship through taking part in the field trips to top universities and companies, and receiving lectures from entrepreneurs and venture capitalists in Silicon Valley.